need to be based on biological facts. Otherwise they are just fantasies, and have no grounding in reality. Below i’m going to layout my current philosophy, or mental framework, for the development of mixed modal athletes…..
Note- for those unfamiliar with Kiely’s work I strongly recommend giving the following paper titled, “Periodization paradigms in the 21st century: evidence-led or tradition driven?” a read. The photograph, attached above, is a simplified pictorial representation of a concept model I created for the long term development of mixed modal athletes. Essentially it’s a system which allows me to target multiple adaptations through different systems interconnections, and tangential relationships. Which allows me to explore alternative ways of layering, and phasing, specific protocols for each adaptation. 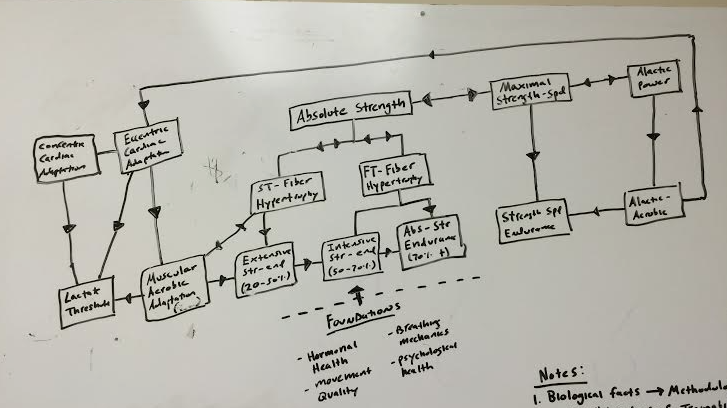 With the various demand of the sports I believe this type of model is the way to go for long term development as trying to train all characteristics independent of one another will inevitably lead to hormonal dysfunction and injury- both of which are rampant, and ever increasing, among the “elites” in the sport of fitness. *Note- this model, in its pictorial representation, is predicated on tacit knowledge as well as the way I organize the information between my ears. As such it may not make sense to you in the form depicted above. That being said, i’ve done my best to explain it below. If you have any specific questions feel free to shoot me an email with the subject line “a concept model for mixed modal athlete development”. To start with a simple example let’s examine absolute strength and it’s relationship to the various forms of strength capacity (extensive, intensive, and absolute strength endurance). As i’ve mentioned in previous articles increasing absolute strength has a diminishing return as it relates to improving muscular endurance, which is a consequence of it’s indirect relationship with said qualities. In actuality improving one’s absolute strength is merely a prerequisite, or foundational element, for building say extensive muscular endurance. Whereas a more specific form of strength development, targeting extensive muscular endurance, would be oxidative fiber hypertrophy (which can be achieved through static-dynamic protocols). When examining the diagram you’ll also notice that muscular aerobic adaptations play a direct role in improving extensive strength capacity as well; and that one’s ability to develop muscular aerobic adaptations are limited by the degree to which they’ve incurred cardiac aerobic adaptations (which have overlap, but are not in fact one in the same as i’ll discuss shortly). Which brings me to my next point- as coaches we need to identify weaknesses on a less myopic level. We can no longer, simply, say that an athlete needs to prioritize aerobic capacity, muscular endurance, or improve their lactate threshold. Instead we need to take out our magnifying glasses and found out WHY they need to improve said characteristics, and WHAT that actually means in their scenario (ie- do they need muscular or cardiac aerobic development, extensive vs intensive vs absolute strength capacity etc) . In this vein I also think many coaches go wrong by ascribing a group of boxed characteristics under the same umbrella term, and assuming they will all improve in tandem with a given training protocol. A real world example of this is the prescription of MAP (maximal aerobic power) training when trying to target cardiac aerobic adaptations, or “build an aerobic base”. This is an instance of not fully understanding biological mechanisms, what adaptation said protocol elicits on a physiological level, or questioning what exactly you’re trying to achieve with a given training protocol. Another boxed characteristic I see incorrectly prescribed all too often is alactic-aerobic work, which if done correctly has the potential to yield concurrent developments in alactic-power, strength-speed capacity, and cardiac aerobic adaptations- i’ll touch on this point further in an upcoming article, but suffice it to say that EMOM olympic lifts, and the likes, are missing the boat big time. So… where does this leave us? 1. As coaches we need to create, evolving, mental frameworks based on what we’ve learned and experience working with athletes. 2. The training principals we ascribe to, and the methods we use, must be based in biological facts. 3. Training methods, based on physiological mechanisms, remain as theory until proven otherwise on an, individual, case by case basis. 4. No one training model, mental framework, or philosophy is correct. The point i’m trying to make is that having a philosophy, which you abide by, gives you a framework to organize your thoughts. Then as you assimilate new knowledge, and re-learn what you already know more deeply, you can keep what works, discard what doesn’t, and rebuild your current paradigm over and over. Ideally this process should continue indefinitely and over time you’ll extrapolate ideas and build new frameworks. On this note 10-20% of the above model will likely me replaced, or reworked, within the next year. Only time will tell. As previously stated the training principals we ascribe to, and the protocols we develop, must be based in biological facts. I’d take this one step further and say the methods we select, and the way we express them, must be based on the individual. However, this isn’t as simple as it looks on paper. Even the protocols we know work don’t work as they “should” for 100% of athletes 100% of the time (biology often works on a bell curve). The key word here being “should” as biological systems are far too complex to be fully reduced with theory. Despite what the science, or empirical data, says a given protocol will stimulate varying systems among individuals. Because of this the experimental protocols we create need to be based on known physiological mechanisms, but continue to remain as theory until proven otherwise on a case by case basis. Below i’ve included a procedures i’m currently tinkering with, which builds off the concept model outlined above…. The goal of this protocol is oxidative fiber hypertrophy, muscular aerobic adaptations, and consequently extensive muscular endurance development. We know that rate of force development dictates the fiber recruitment, and that oxygen carrying blood cannot enter the muscle while it’s contracted. As such this creates a scenario is which we desaturate the muscle, consequently leading to hypoxia of the slow twitch fibers (ie- the slow concentric/eccentric coupling will recruit ST fibers whilst the limited ROM will maintain tension on the muscle). Which will hypertrophy the oxidative fibers and increase the number of mitochondria present (in theory one can hypertrophy their ST fibers to the extent that that they can elicit higher outputs, aerobically, than others are able to anaerobically). The goal of this protocol is to concurrently elicit muscular and cardiac aerobic adaptations. As I mentioned previously, with the example of maximal aerobic power training, these adaptations occur at different intensities (though there is some overlap). However, once we know the rules we can them begin to break them (sort of). As a general statement the intensity at which we optimally achieve muscular aerobic adaptations (and create hypoxia in the muscles) it too high to make cardiac aerobic development. On the converse the intensity at which we are optimally targeting cardiac aerobic developments it too low to create hypoxia in the muscle and achieve significant developments in muscular aerobic adaptations. By applying partial vascular occlusion to the upper thigh we’re able to induce local hypoxia in the leg musculature while staying well below the lactate threshold and operating in a range that is also conducive to aerobic adaptations of the heart. In this vein of though I believe we’ll be seeing more of these types of protocols as tech like the moxy monitors become more mainstream.